So I swapped motors, and the new motor has an s5 front cover, so I swapped it with my s4 one along with the pulley and the CAS. I am trying to set the timing, and I have it hooked up to my haltech. so at -5 the trigger angle should be about 65, and that's what it used to be set at and it worked perfectly. NOW if I set the trigger angle to 65 it runs like crap. It actually runs very well with the angle set to 25. This setting causes the front cover to point about ~20 on the OTHER side of the orange timing mark. almost to where the belt is on the first picture. does anybody know the timing differences between these 2 different kinds of pulleys? How can I set my timing with this pulley? I really don't want to just swap on the pulley that came with the motor because mine is powdercoated and I don't want to risk having the torrington bearing slip off. is it safe to just set the timing to where the car sounds good? Also, I have a coolant leak coming from somewhere around the back of the motor. I can't see it coming from the TB coolant line on the top of the rear iron, or from either of the turbo coolant lines, or from under the LIM. use the original pulley that came off the motor. if you're intent on using the powder coated pulley, fill in the marks and translate them from the old pulley. Last edited by RotaryEvolution; 10-13-11 at 10:02 PM. crap, sorry I actually have one more problem lol. it sort of goes with the coolant leaking... There is a little white smoke coming from the (3in RB rev II, so no cats or restrictions) exhaust. it's noticeable at idle, and it gets worse when I give it gas, but it's not as bad as when I had blown coolant seals and I could fill the block with smoke in like 30 seconds. Maybe it isn't a big deal, especially since I replaced the front cover and there could be cleaning agents still in the intake? I have let it idle for about a half hour or maybe more and it seems to remain constant all the time. I guess I'm looking for reassurance because I'm super paranoid about the engine's condition. I COULD do that, but I don't want to risk smashing the torrington bearing when I take the front pulley bolt off. That solution will be my last resort. Does anybody know anything more about this mysterious mismatched pulley problem? Why do multiple pulleys fit if the timing marks are different? who said you have to remove the crank bolt? put the original pulley on, set it to leading TDC, remove it, put on your painted pulley and stamp it with a hammer and chisel, remove, switch to trailing tdc, rinse and repeat. gilmers don't have any timing marks whatsoever so you have to do a process like that. One an S4 Pulley and one an S5 pulley????? screwed around the timing when setting the Haltech. use the pulley that the engine had on it. (you can always powdercoat it later). you can't use the s4 on an s5 or reverse. so how is it the first pic shows red then yellow ? Last edited by bumpstart; 10-13-11 at 11:44 PM. ok, so I took my old pulley and my new pulley off their respective engines and compared them. The marks may indeed have been just colored wrong like you suggested bumpstart. I don't really understand what you mean by flywheel bite though... is there a reference picture or something somewhere? what's an auto balance? Anyway, I put the pulley back on with the front cover pointer at the yellow mark with the CAS gear lined up. set the trigger angle to 65, and... it ran like ***. according to the timing light, my timing is spot on, but the engine stumbles and can barely make 2500rpms. I screwed with the trigger angle, and it now likes ~35 instead of ~25, but that makes the marks show up somewhere under the water pump. I drove the car around the block like that and it seemed just fine. WTF is going on? Why does my car not want to run with the pulley lined up? Also, I sometimes can't get the timing light to fire from the T1 coil wire, and only that one. Does that mean my trailing coil is dying? Could that affect this somehow? so,, what does that mean for the OP? well,, that s5 hub may well be different to the s4 one,, but which one to use >? I have the stock flywheel on there, so if I remove the inspection plate on the passenger/turbo side I should rotate the flywheel until the weighted part is facing me ie 90 degrees? Then take out the trailing 2 plug and rotate the engine Counter clock wise until I see an apex seal. mark the pulley with a marker at the front cover pointer. 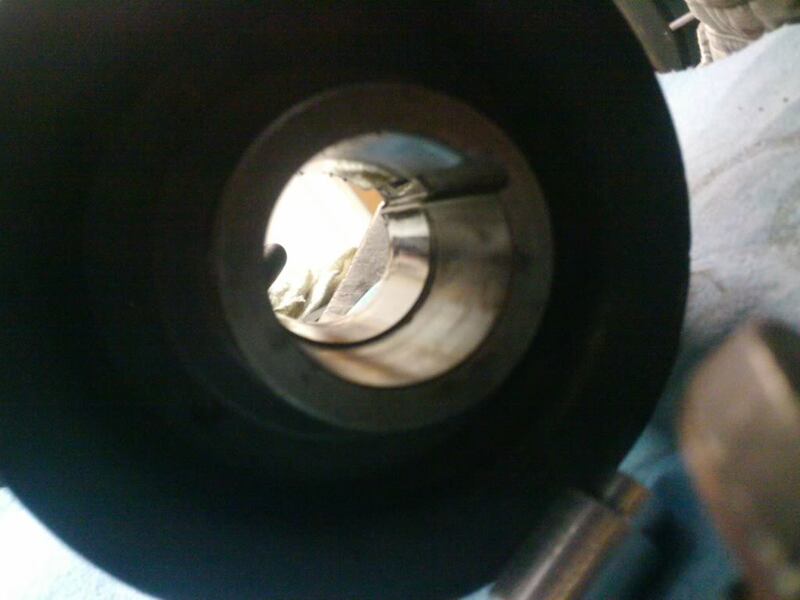 then rotate the motor clockwise until I can see that apex seal in the Leading 2 hole. the yellow -5 TDC mark is between these 2 marks? also, is there a way to find the -20 TDC mark by doing something similar? Pully and hub should be treated as a matched pair. If you mix pullys and hubs you cant gaurantee accurate timing marks. Take a matched pair, spin to leading or trailing, pull off matched pair, put on random hub with super sweet pully, make a mark on new super sweet pully. Repeat for leading/trailing. Store nasty old matched pair in bottom drawer of toolbox after sticking tape on pully that says "DONT THROW AWAY"
Do a search, there is volumes about it on this site. I know it's been discussed, but making a custom set of timing marks for each engine would be a manufacturing nightmare. You'd have to manually mark each one after the engine is assembled rather than just drilling all the holes in the same place and having a machine mark the same spot on the pulley. Bumpstart's trial shows the variation between certain pulleys which could correlate to different spark plug locations. Maybe there is a different part number for the USDM s4 turbo pulleys? 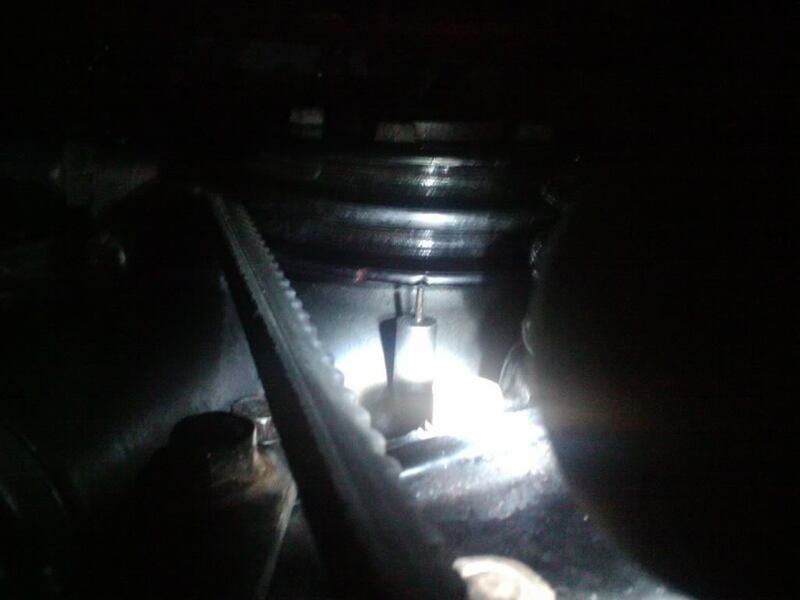 there is no magic method of finding an accurate TDC with the engine assembled(the plug hole method is also a rough estimate since the plug holes are not located in exact dimensions top to bottom and bottom to top, there are also different splits depending on the housings). assume the original pulley was correct and transfer the marks. it takes 5 minutes. Maybe there is a different part number for the USDM s4 turbo pulleys? I don't know how one might identify a loose pulley in a box, don't bother, and no. hold the clutch pedal down with a stick and use a matching hub and pulley (either the original two or the pair that came off whatever motor you sacrificed, buuuuut the original is the best bet). holding the clutch pedal down keeps the eshaft pushed forward so the bearing can't drop. 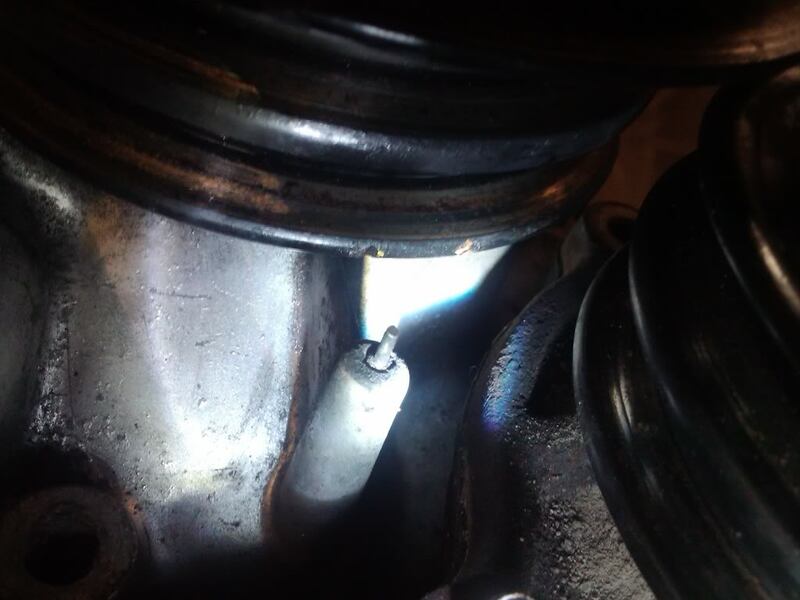 I ran into this problem when I built my motor, my turbo would glow, I was boosting at light throttle, and it ran like total ****. swapping back to the original pulley and hub then setting the timing solved the problem immediately (IIRC I was using the original hub, but the pulley from my donor motor. don't do that). 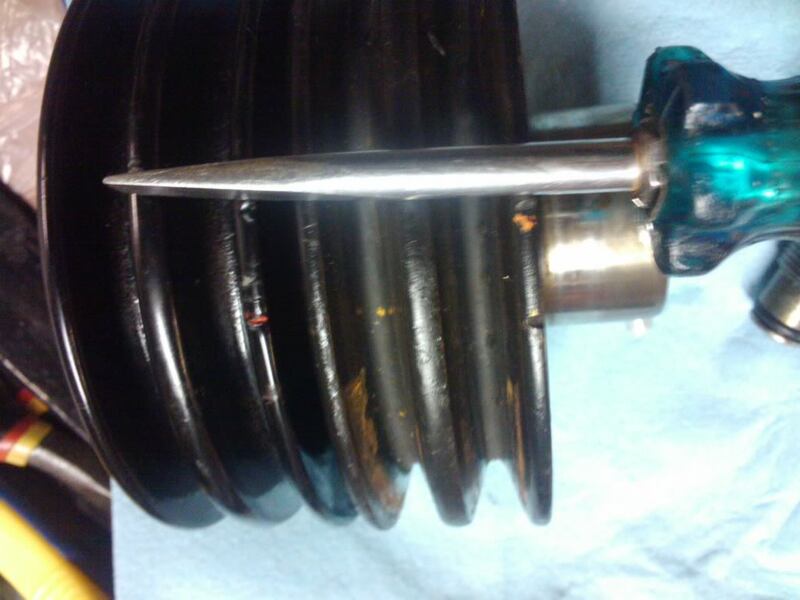 well, the most accurate method seems to be setting the front e-shaft keyway to exactly the 9 oclock position at which point the leading mark on the hub/pulley combo should match up to the pointer. usually it's pretty evident if the pulley/hub you grabbed isn't a match as 15 degrees is pretty noticably off. i just don't understand why they made different sets, the timing variations aren't an issue with the shaft position as the timing marks on the front cover are all the same. it's just a total pita to do all of this with the engine in the car and it's just lovely when you get someone with an engine that has the incorrect pulley set installed, rebuilt by someone who grabbed parts out of a box of parts without any regard. what's worse is the 12As with the equal bolt holes so the timing can be off in 90 degree increments. Last edited by RotaryEvolution; 10-16-11 at 02:20 PM. Alright, So I decided to just swap pulleys and hubs back to the motors that they came from. First thing I did was put the car in gear and get the front hub bolt started. I had to put the car in 5th, because I was actually moving the whole car WITH the hand brake on when it was in 1st! The second it came loose (maybe half a turn) I went and shoved a 2x4 on the clutch pedal to hold it all the way down. I ten removed the bolt and the hub. These are pic of the two hubs together facing the same way. Anyway, They look about the same. They're only a few degrees off in anything. So I said, what the hell and swapped them anyway. lined up the yellow mark with the front cover pointer, checked that the CAS was lined up with it's pointer by removing it and taking a look. it was perfectly aligned, so I thought I was wasting my time, but proceeded regardless. upon tightening everything back down and starting the car I hooked up the timing light and what do I find? THE TIMING IS WAY THE **** OFF AGAIN. except this time in the right direction, with the marks about 40 degrees toward the CAS. I didn't have my laptop with me to adjust the trigger angle, but setting it to 65 from 25 should move it back to just about lined up. I will post results. MORAL: KEEP THE HUB/PULLEY that came with your engine. They are different sometimes, and it is very hard to tell if they are! I also found my coolant leak, it was just the heater hose needed to be tightened. nevermind... it didnt work. The trigger angle has to be set to 95 in order to get the timing marks to line up now. and the car runs like ****. it still wants the trigger angle to be set to something like 30 for it to run decently. so if I stab the CAS as per the FSM, but I need to set the trigger angle to an absurd number I can change the trigger tooth? I actually just got off the phone with my tuner and he said DO NOT change the trigger tooth. the trigger tooth corresponds to the actual teeth in the CAS, and changing it is more or less fooling the ECU into doing something instead of having it set up correctly. He suggested I jumped a tooth while installing the CAS, as I'm off by about one tooth (95-30 = 65 which is just where it should be). He also agreed that the Haltech doesnt operate properly if the trigger angle is set below 45 or above 80, which could be why my car runs like diarrhea.